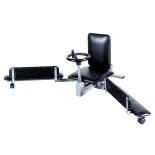 The Master Leg Stretcher is a great stretching machine for all users, from beginners to advanced trainers. Constructed for heavy usage with steel gear system. Features a folding padded backrest and removable turn wheel. • Some assembly required. * Bulky item. Add'l shipping charge will be applied. 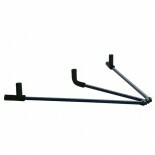 ..
A portable and inexpensive way to stretch your legs. MINIMAL ASSEMBLY REQUIRED. ..